Düsseldorf - After returning to Germany’s top flight following a 15-year absence, Fortuna Düsseldorf certainly wrote their chapter in the Bundesliga’s 50th yearbook, even if the ending was far from fairytale. A 3-0 final-day loss to Hannover 96 saw the Flingeraner leapfrogged in the standings by FC Augsburg and 1899 Hoffenheim as they were relegated from the Bundesliga for the fifth time in their rich history. “It’s a bitter moment for us,” said their visibly distraught head coach, Norbert Meier, after the game. 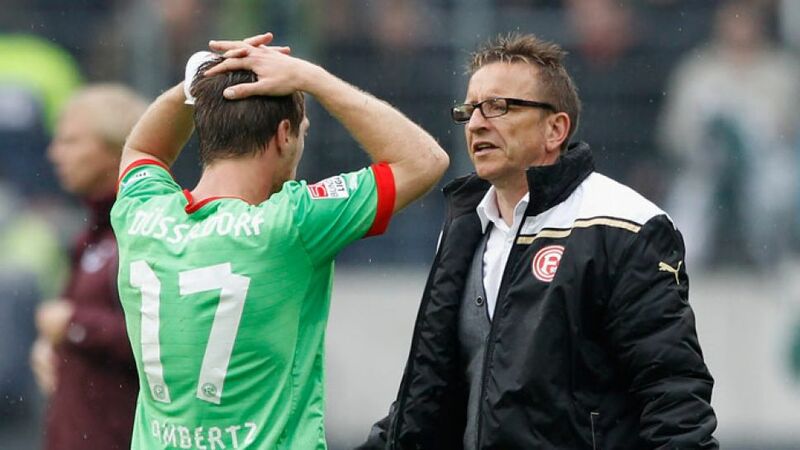 The wounds are yet to heal, but Fortuna will hopefully come to the realisation that they have plenty to be proud of despite coming up short in their bid for another bash at the Bundesliga. Indeed, the season began remarkably promisingly for the two-time DFB Cup winners. A 2-0 win on Matchday 1 against Augsburg turned into a five-game unbeaten streak as Fabian Giefer, one of several young German keepers to make his mark this season, went 452 minutes without conceding. Impressive performances in the 1-1 draw against then-reigning champions Borussia Dortmund and the 4-0 victory at home to Eintracht Frankfurt inspired more than just hope amongst the Düsseldorf faithful. “The lads have been thrown in at the deep end, but still manage to give it everything they’ve got,” said Lambertz following Fortuna’s biggest win of the season. There were numerous individual anecdotes too. Captain Andreas Lambertz made history by becoming the first German player to play for one club in each of Germany’s top four divisions, and the incredible rise of Australian international Robbie Kruse, who rightly made just nine starts during the 2011/12 Bundesliga 2 campaign but featured on 30 occasions this term, scoring four goals and assisting a further six, was another major positive. Yet the steely grit and determination that ensured they were nine points clear of the drop zone come Christmas soon dissipated in the second-half of the campaign. An element of misfortune certainly played its part, not least the loss of striker Mathis Bolly to injury, but ultimately the newly-demoted side can only hold themselves responsible after closing out the campaign with a 12-game winless streak. While the ESPRIT-Arena proved a tough ground for visiting teams, Fortuna were certainly let down on their travels, where they collected just nine points from a possible 51, the worst away record of any Bundesliga side.